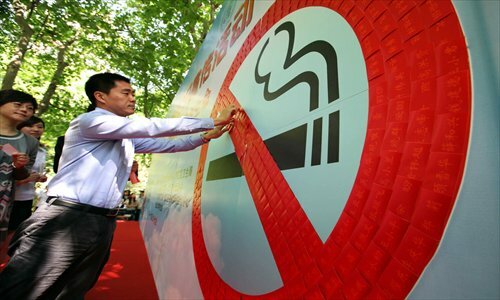 The Shanghai city government has fined individuals and businesses 313,505 yuan ($50,267) over the first nine months of this year for violating the city's smoking regulations, the local health promotion authority announced at a press conference on Thursday. The total was almost twice the amount the government fined over all of last year. As of the end of September, four regulation enforcement authorities conducted 230,531 inspections and fined 77 individuals and 179 public spaces, according to the Shanghai Municipal Health Promotion Committee. Under regulations introduced on March 1, 2010, smoking is prohibited in 13 types of public places, including hospitals, schools, museums and libraries, as well as on public transportation. The maximum fine for an individual violation in public spaces such as hospitals and schools is 200 yuan. Businesses can be fined as much as 30,000 yuan for failing to prevent smoking on the premises. Authorities at the district level have been enforcing smoking regulations more strictly this year at Internet cafes, restaurants and entertainment establishments - places where violations were most prevalent, said Gu Xiping, a press officer with the Shanghai Municipal Health Promotion Committee. According to the regulations, restaurants and bars larger than 150 square meters with more than 75 seats must confine smoking to designated areas. These establishments must also post no-smoking signs and remove items related to smoking, such as ashtrays, from non-smoking areas. The committee has also seen an increase this year in public involvement with the enforcement of the regulations. The number of volunteer inspectors had increased to 1,855 as of September, up from a total of 1,170 last year, according to the committee. "To raise public awareness about these regulations, we will continue to run promotion campaigns next year. We are also going to learn from the successful experiences of Hong Kong and other overseas cities," said Li Zhongyang, vice director of Shanghai Municipal Health Promotion Committee. "We hope that local residents will have more self-discipline and consider their own health and the health of other people when it comes to smoking," Li added.